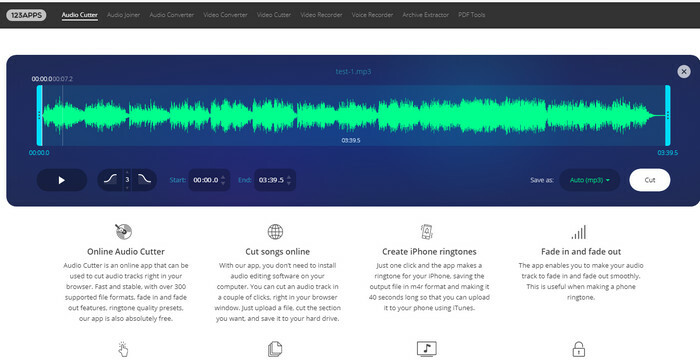 If you have any needs to cut audio clips from songs or kinds of music files, then this article for introducing three ways to finish this task could help you out. 1. Prefer certain part of favorite songs and want to keep them alone. 2. I just want to split few seconds from an audio extracted from YouTube video. 3. The interview of my idol was hilarious last night and I want to save her conversion as ring tone. Wooh! 4. Some chapters of audio book are so great, so I want to trim audios from it and share those with my friends. And actually there are many more different reasons. We can type our needs in Google and choose exactly what we need, just like now, put “cut audio” or “split mp3 files” in search blank. Among these results, there are three ways I found that could helpful for users of different levels. To do it online is simplest way to meet our needs, like to download YouTube video, to convert video free or the other way around, to merge audio. You may try this convenient site when you consider online solution: http://toolster.net/mp3_cutter. Note: a 4-steps tutorial is shown on the lower left quarter of this page. It’s simple enough to follow. After you load music files, the interface will change, just like picture shown below. The vertical bar with a green point above is like a progress bar which will move along while music is playing. These two green triangles with orange space between is the audio part you want to cut. So drag them based on your needs, this free mp3 splitter always supports you to listen to selected part. Click “Cut”. This tool will trim audio for you automatically and open the preview window. Mp3 is commonly selected and you may also save files as M4R to make iPhone ringtone, after choosing the right audio format, just click the big green button “Download”, a pop window will show up asking you where to save the cut files. Just set it freely. This method is used to cut music when you don’t have certain tools or applications installed in computer, simple and fast in one way, but on the other hand, disadvantages also include limited output audio format, uncertain network speed and risk of cracked browser. 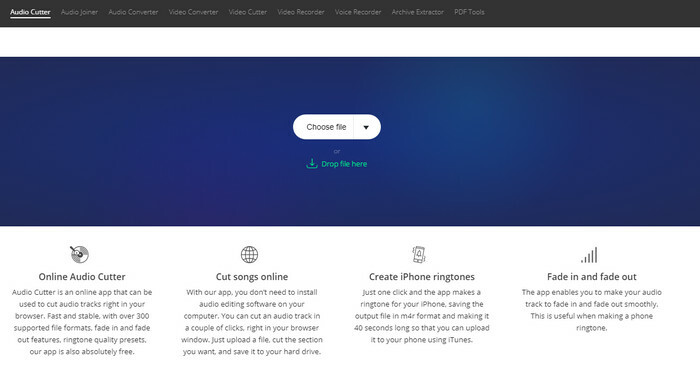 If you want to upload created music files to YouTube, or want to increase audio sound a little bit or playback created audio files in smart phone, most importantly, to trim audios by audio cutter equipped with batch cutting and conversion function. Then the HD Video Converter Factory Pro is your best choice. Just download this tool and install it on your computer. Here is a simple guide of using it to cut mp3 files in batch mode. Add your music files or simply drag them into this tool. There’s a scissor icon in every process bar. Before you trim audio, these scissor icons are in gray background color, after clicking it, a pop window will show up. Now you just need to drag these two blue sliders to adjust the start and stop points of your music segment. Or you just type the precise time parameters to “Start Time” and “End Time” blank directly. Now, press OK button, just repeat process above to another audio. Through this, you can cut music files in batches. And background color of these scissor icons will become blue. The HD Video Converter Factory Pro supports various output audio formats and common devices; you can set it based on your own needs. 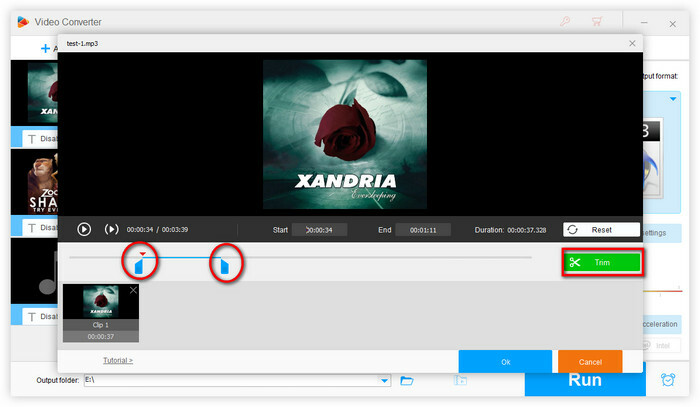 Then, click the big blue button “Run” and start to cut audio clips in batches, the last thing to do is to press “Open Folder” to find your created audio files or you can set your own destination too! Now all your favorite music clips are saved with this best mp3 splitter. More than to cut sound or split mp3 files, the HD Video Converter Factory Pro is also a helpful HD video editing tool. 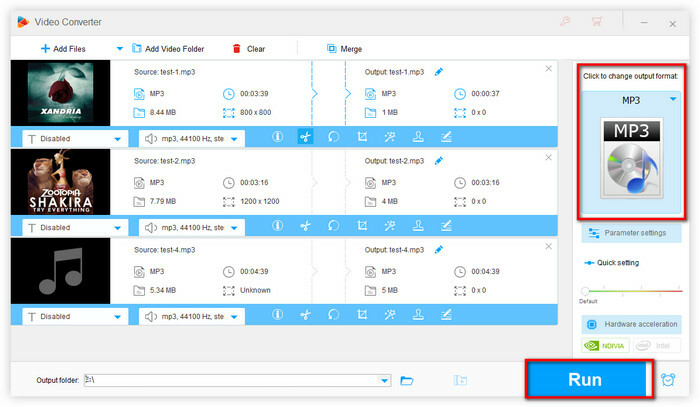 It can help you shrink video file size and merge it to save your storage space, and more user-friendly features including cut video clip, upload video to YouTube etc. If you have some installed software already, like VLC player, then this simple guide would give you some hints. 1 Open VLC player and add the song you want to cut. 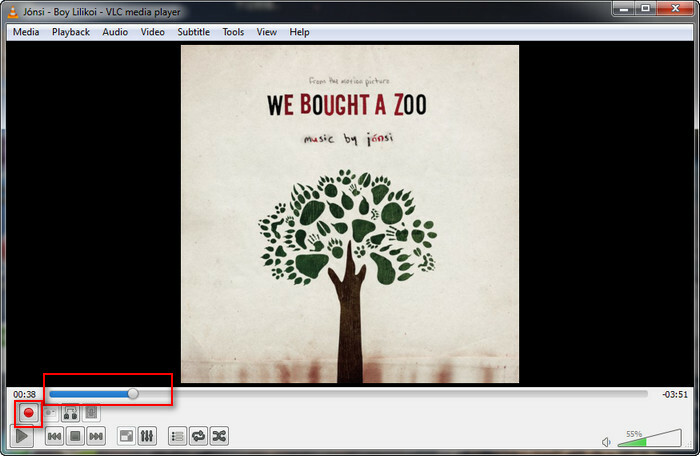 2 Click on “View” (on VLC top menu) and Select “Advanced Controls”. Once selected, the advanced controls will show at the bottom of VLC player (a red record icon). 3 You can select beginning point by dragging the slider. Click on red record icon to start recording. 4 To click the same red record icon again to stop recording. These created audio files are normally stored in C: Users\Your System Name\MyMusic or Music. VLC player is most people’s first choice because this player has many useful tricks for users, such as rotate video, increase video volume and add subtitles to videos etc. But it’s not convenient when you need to convert audio files to certain format while cut sound in the same time. Furthermore, you can’t move the slider bar; instead, you need to let the audio file playing because the setting of VLC is real time. Sums up, I believe you can find the best way among the three methods suggested above; sometimes you just need to figure out by yourself. Hope this article would help you out. Make illustrious balance with output quality and compression ratio as well as crop video clips and merge chapters. Convert all kinds of videos to play on all kinds of devices (like your phone and tablet) since easy to navigate, not to mention quicker. With a straightforward interface and impressive functionality, this app provides a comprehensive solution for all of your video conversion needs. Super fast and simple to use. Built in profiles are comprehensive and save a lot of time.Compression is very good!